Gas is one of the four major states or phases of matter, along with solid, liquid, and plasma. Each state is characterized by distinct physical properties that are explained by modern science in terms of the energy of the atoms or molecules comprising the matter. Matter in the gas state characteristically has no independent shape or volume and tends to expand to fill any size or shape of container. 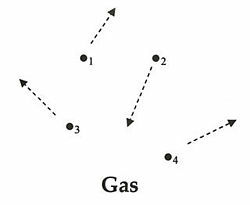 Gas exists in the middle of a heating continuum in which heating the gas can cause its atoms or molecules to become (wholly or partially) ionized, turning the gas into a plasma. Cooling the gas will eventually cause it to liquefy or, in some cases, to solidify. Water is the classic example material representing the phase changes between solid (ice), liquid (water), and gas (steam). "Dry ice" (frozen carbon dioxide), which evaporates or sublimates directly to a gas, models another mode of phase change. Elements that exist as gases at the normal conditions of temperature and pressure on the earth play many valuable roles for living systems and the environment. For example, diatomic oxygen (O2) is essential for breathing; ozone (O3) in the stratosphere blocks harmful ultraviolet (UV) radiation from reaching the Earth; methane (CH4), the main component of natural gas, is a useful fuel; carbon dioxide (CO2) is essential for plant growth through photosynthesis, and it is an important greenhouse gas that helps to maintain the warmth of the Earth; neon (Ne) is useful for advertising lights; and helium (He) is used to inflate balloons and as a shield during arc welding. The word "gas" was apparently proposed by the seventeenth century Flemish chemist Jan Baptist van Helmont, as a phonetic spelling of his Dutch pronunciation of the Greek word "chaos," which was used since 1538, after Paracelsus for "air." Although Aristotle, in ancient Greece, classified air as one of the four elements, gases were not seriously studied or understood until the past two hundred years. Prior to 1727, it was still thought that gases were generally of the same nature as regular atmospheric air. (Although Robert Boyle had unknowingly prepared both hydrogen and nitric oxide gases as early as 1659, he still did not recognize that these were of a different nature than atmospheric air.) In 1727, Stephen Hales realized that this was not the case at all. He developed handling techniques that laid the foundation for pneumatic chemistry today. In the 1750s, Joseph Black was the first scientist to prepare and identify a gas (what he called "factitious airs"): Carbon dioxide. His doctoral dissertation of 1754 described how the gas had been liberated when he heated basic magnesium carbonate. For the next 20 years, an intense period of activity in the area resulted in the identification of virtually all the common permanent gases by such scientists as Henry Cavendish, Joseph Priestley, and Carl Wilhelm Scheele. Oxygen was discovered at this time, first by Scheele in 1773, and independently co-discovered by Lavoisier and Priestley in 1774. From the 1770s until the 1850s, the caloric theory was the commonly accepted theory on gas behavior. Its two distinguishing characteristics were that particles of gases were conceived to be stationary, held in position by repulsive forces thought to exist between them; and that these repulsive forces were attributed to the presence of a subtle, weightless, and highly elastic fluid of heat ("liquid fire") known as caloric. Around the turn of the century (1798), Count Rumford questioned the relationship between gas and the production of heat by friction, theorizing that the suspicious absence of a change in specific heat of gas meant that the accepted model of a gas was wrong. Though most scientists ignored or refuted his argument, the seed of doubt had been planted. In the following decades, the caloric theory was heatedly debated, and much research was done during this period. Of particular note is John Dalton's discovery of diffusion in 1808, drawing worldwide attention. He also did notable work on gas expansion, as did Joseph Louis Gay-Lussac. The really serious cracks in caloric theory, however, began to appear after 1815, with the work of Jean Baptiste Joseph Fourier, Dominique Francois Jean Arago, Pierre Louis Dulong, Augustin-Jean Fresnel, and Alexis Therese Petit. Each young man, representative of the new generation of science, had his own rival theory to the one in place, spawning even more debate. Beginning in the mid-1850s, the kinetic theory of gas began to rise in popularity. This theory, commonly accepted today, states that rather than remaining static, gas molecules are in motion. How and why this change took place is a live issue among historians. Following this, gas theory as it is known began to appear. Atoms or molecules in the gaseous state basically move independently of one another, with no forces keeping them together or pushing them apart. Their only interactions are rare and random collisions. The particles move in random directions, at high speed. The range in speed is dependent on the temperature. Following the second law of thermodynamics, gas particles will immediately diffuse to homogeneously distribute themselves throughout any any shape or volume of space defined by a material boundary or potential energy barrier. The thermodynamic state of a gas is characterized by its volume, its temperature, which is determined by the average velocity or kinetic energy of the molecules, and its pressure, which measures the average force exerted by the molecules colliding against a surface. These variables are related by the fundamental gas laws, which state that the pressure in an ideal gas is proportional to its temperature and number of molecules, but inversely proportional to its volume. Like liquids and plasma, gases are flowing and free moving fluids: they have the ability to flow and do not tend to return to their former configuration after deformation, although they do have viscosity. Unlike liquids, however, unconstrained gases do not occupy a fixed volume, but expand to fill whatever space is available to them as defined by material boundaries or potential energy barriers. The kinetic energy per molecule in a gas is the second greatest of the states of matter (after plasma). Because of this high kinetic energy, gas atoms and molecules tend to bounce off of any containing surface and off one another, the more powerfully as the kinetic energy is increased. A common misconception is that the collisions of the molecules with each other is essential to explain gas pressure, but in fact their random velocities are sufficient to define that quantity; mutual collisions are only important for establishing the Maxwell-Boltzmann distribution. Gas particles are normally well separated, as opposed to liquid particles, which are in contact. A material particle (say a dust mote) in a gas moves in Brownian Motion, the ceaseless movement of finely divided particles in suspension. Since it is at the limit of (or beyond) current technology to observe individual gas particles (atoms or molecules), only theoretical calculations give suggestions as to how gas particles actually move—it is known their motion is different from Brownian Motion, however. The reason is that Brownian Motion involves a smooth drag due to the frictional force of many gas molecules, punctuated by violent collisions of an individual (or several) gas molecule(s) with the particle. The particle (generally consisting of millions or billions of atoms) thus moves in a jagged course, yet not so jagged as one would expect to find if one could examine an individual gas molecule. The classical ideal gas can be separated into two types: The classical thermodynamic ideal gas and the ideal quantum Boltzmann gas. Both are essentially the same, except that the classical thermodynamic ideal gas is based on classical thermodynamics alone, and certain thermodynamic parameters such as the entropy are only specified to within an undetermined additive constant. The ideal quantum Boltzmann gas overcomes this limitation by taking the limit of the quantum Bose gas and quantum Fermi gas in the limit of high temperature to specify these additive constants. The behavior of a quantum Boltzmann gas is the same as that of a classical ideal gas except for the specification of these constants. The results of the quantum Boltzmann gas are used in a number of cases including the Sackur-Tetrode equation for the entropy of an ideal gas and the Saha ionization equation for a weakly-ionized plasma. The ideal gas law is an extension of experimentally discovered gas laws. Real fluids at low density and high temperature, approximate the behavior of a classical ideal gas. However, at lower temperatures or higher density, a real fluid deviates strongly from the behavior of an ideal gas, particularly as it condenses from a gas into a liquid or solid. As a gas is compressed into a smaller volume, the temperature being maintained constant, the density increases and the molecules make more frequent collisions with the walls, raising the pressure. Boyle's law describes this behavior, stating that for a given mass of gas at a fixed temperature the product of pressure and volume is constant. Charles' law states that for a given mass of gas, if the pressure is kept constant, the volume increases linearly with the temperature. Avogadro's law states that at constant temperature, pressure times volume will have the same value for all gases, provided they contain the same number of molecules. This is based on the assumption that two different gases at the same temperature must have the same average molecular kinetic energy, since they are each individually in equilibrium with the walls of the container. Dalton's law of partial pressure states that at a fixed temperature, the pressure of a mixture of gases is equal to the sum of the pressures which would be exerted by each gas separately, if the other constituents were not there. In the above mentioned Sackur-Tetrode equation, the best choice of the entropy constant was found to be proportional to the quantum thermal wavelength of a particle, and the point at which the argument of the logarithm becomes zero is roughly equal to the point at which the average distance between particles becomes equal to the thermal wavelength. In fact, quantum theory itself predicts the same thing. Any gas behaves as an ideal gas at high enough temperature and low enough density, but at the point where the Sackur-Tetrode equation begins to break down, the gas will begin to behave as a quantum gas, composed of either bosons or fermions. An ideal gas of bosons (for example, a photon gas) will be governed by Bose-Einstein statistics and the distribution of energy will be in the form of a Bose-Einstein distribution. An ideal gas of fermions will be governed by Fermi-Dirac statistics and the distribution of energy will be in the form of a Fermi-Dirac distribution. As noted above, real gases, or imperfect gases, do not exhibit the exact properties of ideal gases, although the approximation is good enough that it is often used to describe them. The approximation really breaks down at high pressures and low temperatures, where the intermolecular forces play a greater role in determining the properties of the gas. Under these conditions, the model of a molecule as a "billiard ball" becomes too crude, and requires a more realistic model. In these cases, more complicated equations must be used to more accurately describe their motion. Van der Waals forces also come into play here, describing the attractive forces between atoms. It must also be noted that real gases are not perfect spheres, and that they are surrounded by short-range force fields. Still, even using kinetic theory, it is necessary to assume that the force field about a molecule is spherically symmetric, or else the calculations become simply intractable. Air is a mixture of gases, composed largely of nitrogen and diatomic oxygen (O2). Key to supporting much of Earth's life, all plants reliant on photosynthesis require air, as well as many forms of bacteria, insects, and other animals. Clouds and fog, both made up of water vapor (the gas phase of water). Greenhouse gases such as carbon dioxide, water vapor, methane, nitrous oxide, and ozone, all contribute to the greenhouse effect, or the warming of Earth's atmosphere. Carbon dioxide (CO2) is released into the atmosphere when carbon-containing fossil fuels such as oil, natural gas, and coal are burned; humans also naturally produce the gas through respiration when they breathe. Carbon dioxide is essential to photosynthesis in plants and other photoautotrophs. Ozone (O3) is a form of elemental oxygen gases, occurring naturally in small amounts in the Earth's stratosphere, 15-55 km above the Earth's surface). Here it filters harmful ultraviolet radiation from sunlight. Ozone can be also be formed when a mixture of (O2) and (NO2) is exposed to bright light—a common occurrence in the polluted air of large cities. An excess of ozone can be dangerous for plants and animals, as well as damaging to polymeric materials such as rubber and plastics, causing them to deteriorate prematurely. Aerosol spray propellant, used in whipped cream canisters or cooking spray, is a gas. Nitrous oxide is commonly used. Chlorofluorocarbons (CFCs) have also traditionally been used, but have been phased out worldwide due to the negative effects CFCs have on Earth's ozone layer. Nitrous oxide is also used in laughing gas, an anesthetic. It is a dissociative drug that can cause analgesia, euphoria, dizziness, flanging of sound, and slight hallucinations. Most often used in dental procedures, it provides inhalation sedation and reduces patient anxiety. The noble gases or inert gases (elements in group 18) are commonly used in lighting. Argon is often used as a safe atmosphere for the inside of filament light bulbs. Krypton is also used in lasers, which are used by doctors for eye surgery. Gases are also used in chemical warfare as a terror weapon, meant to instill confusion and panic among the enemy. Dichlorethylsulphide, or mustard gas, for example, was used in World War I, producing large burn-like blisters wherever it came in contact with skin. Another example of gas in chemical warfare is hydrogen cyanide (HCN), infamously employed by the Nazi regime in World War II as a method of mass murder. Propane, naturally a gas but commonly compressed into a liquid for transportation, is used as a fuel for engines, barbecues, and home heating systems. Most typically, it is mixed with smaller amounts of propylene, butane and butylene, and sold as liquified petroleum gas (LPG). Methane, the main component of natural gas, is commonly used as a fuel after commercial synthesization through the distillation of bituminous coal and heating with a mixture of carbon and hydrogen. Alternatively, it may be discovered naturally and then processed to remove the heavier hydrocarbons, such as propane and butane. The combustion of methane is highly exothermic. ↑ Robert Fox, The Caloric Theory of Gases From Lavoisier to Regnault (Oxford: Oxford University Press, 1971), 6-103. Fox, Robert. The Caloric Theory of Gases From Lavoisier to Regnault. Oxford: Oxford University Press, 1971. ISBN 978-0198581314. Hanlon, Mike. Gas Warfare. Trenches on the Web. Retrieved August 29, 2017. Present, R.D. Kinetic Theory of Gases. McGraw-Hill Book Company, Inc., 1958. Ramanujan, Krishna. “Methane's Impacts on Climate Change May Be Twice Previous Estimates.” NASA, July 18, 2005. Retrieved August 29, 2017. Shakhashiri, Bassam Z. "Gases of the Air." Science is Fun. Retrieved August 29, 2017. Shakhashiri, Bassam Z. "Methane." Science is Fun. Retrieved August 29, 2017. Shakhashiri, Bassam Z. http://www.scifun.org/CHEMWEEK/Ozone2017.pdf "Ozone."] Retrieved August 29, 2017. Tabor, David. Gases, Liquids and Solids and Other States of Matter, 3rd edition. Baltimore: Penguin Books, Inc., 1969. ISBN 978-0521406673. WebElements. Periodic Table. Retrieved August 29, 2017. This page was last modified on 29 August 2017, at 15:19.